So, yeah, the title of this blog entry is a little misleading. I wasn’t really at Origins today. I spent the day at the store. It was a nice break from the con, and it’s been a nice day at the shop. Lots of new faces came in today (as most of the familiar faces are likely at Origins!). Anywho, I still have two games that I wanted to talk about. 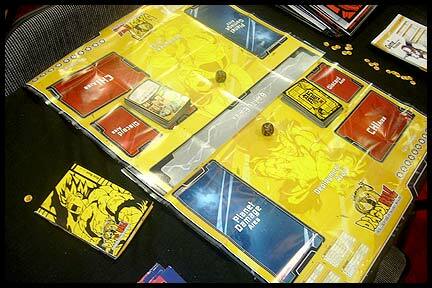 The first is the return of a mega-popular property to the collectible card game format: Dragon Ball Z! 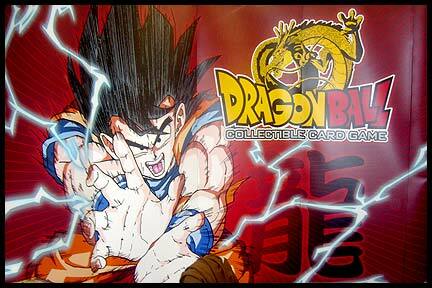 Bandai will be releasing their new Dragon Ball CCG next month. I admit that have a soft spot for the work of Dragon Ball creator, Akira Toriyama (hey, we all have our guilty pleasures, right?). We are going to be carrying this new game which launches on July 18th. We are also planning on running tournaments and organized play. Some of our current Pokemon players are also looking forward to this game, too! It looks to be a lot of fun! So, make sure you keep an eye on our website for more information on when the action will be starting at Alley Cat Games! Kame-hame-HA! There was one other game that caught my eye at the show that I wanted to show you all. It’s called Check Your 6! and it’s from Skirmish Campaigns. 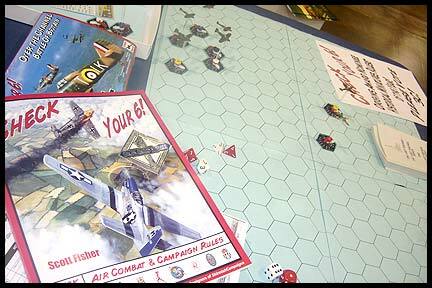 CY6 is a series of air combat and campaign rules that launched last summer and is starting to come into its own. It’s being picked up by the major distributors which should help this neat game find a wider audience. 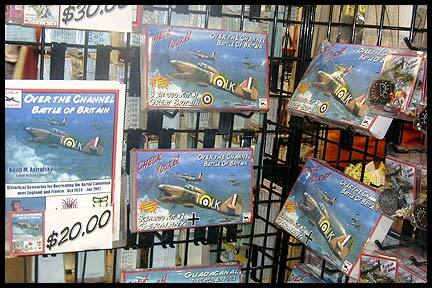 In addition to the main ruleset, Skirmish Campaigns produces a series of Scenario Books such as the Battle of Britain, Guadacanal and Falcon of the Duce. They also make a series of Campaign Packs which include pre-painted miniature planes that attach magnetically to their bases. What a great idea! I’d like to give this game a play and see how sound the rules are. It certainly looks interesting! Lastly, I’ve been feeling a bit nostalgia lately. I was looking around the booth of Steve Jackson Games and got to thinking about their old O.G.R.E. rules from the late ’70s. It was one of the first miniatures games I ever played (even though, back then, it was just cardboard counters) and loved it. Unfortunately the rules are no longer in print, but I was told that the rules will be coming back later this year as a PDF file, and that they are planning an O.G.R.E. 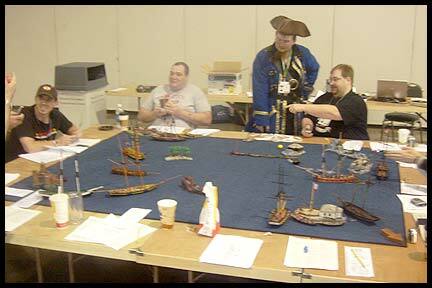 boardgame in late 2008 as well. So, while wandering the Miniatures Hall between running demos for FFG I found a group of folks playing a big ol’ game of O.G.R.E! 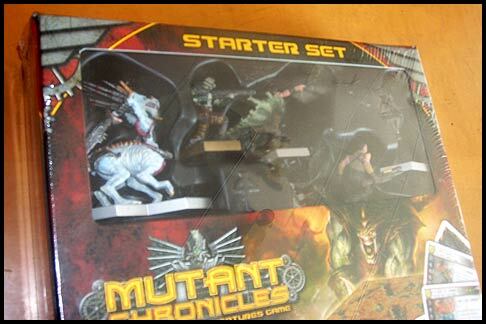 Tomorrow morning it’s back for one last round of Mutant Chronicles demos for Fantasy Flight. Come on by if you haven’t already! 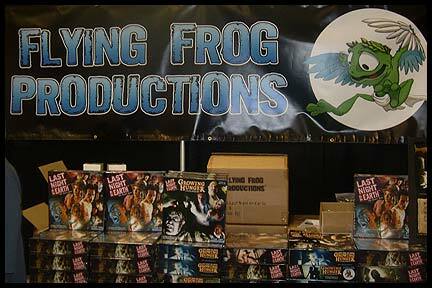 Origins 2008 – Day 2: When Frogs Fly and More! Another day at Origins is over for me. I’m back at the store and reflecting back upon the day. This years con seems….off to me. Now, granted, my convention experiences pretty much begin and end with activities in the Dealers Room. Outside of demos, I don’t play in any games at conventions. I know, I know, that’s sorta crazy. But, when I go I am hoping to find some new games that look interesting that I’d either want to play myself or want for the store. I usually find two or three games that pique my interest. 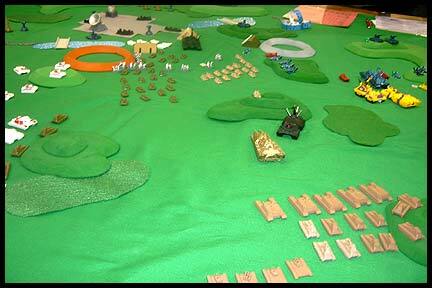 One game I found that I will be ordering in for the shop is The Battle for Hill 21B from Your Move Games. 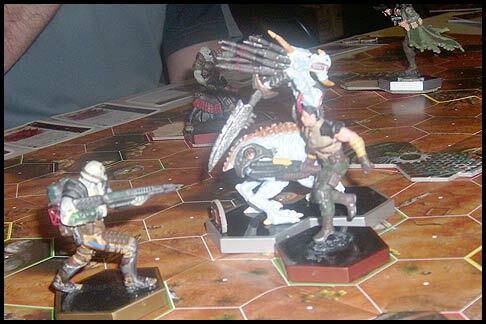 Your Moves Games is responsible for what is, perhaps, the best miniatures game you’re not playing: Battlegrounds Fantasy Warfare. But, more on Battegrounds in a moment. The Battle for Hill 218 is an abstract strategy, non-collectible, card game for two players, taking 15 – 30 minutes to play. It’s easy to learn but has a depth of strategy usually found only in games that take an hour or more to play. The deck box comes with everything needed to play: two army decks, two pairs of Air Strikes, the Hill 218 card and the rulebook. You begin play with the Hill 218 card in play and two face-up air strikes set off to the side of play. One side of the hill is your home base; the other is your opponent’s. You win the game by occupying both bases; if neither player manages this, the player with the most units remaining when all units and air strikes have been played wins. It looks pretty cool, and we’ll have it in stock soon! Battlegrounds Fantasy Warfare is a point-based miniatures game – but without the miniatures. 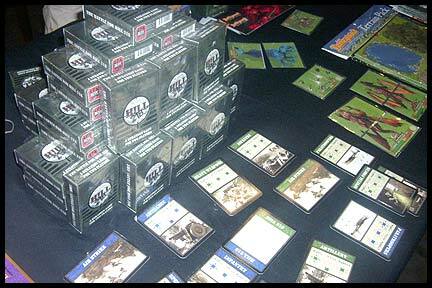 Battleground uses cards rather than painted models to represent your forces. This means a much lower price as well as easier transportation and setup, but don’t be fooled – this is not a “light” war game or a CCG. Battleground is a serious, award-winning wargame that will challenge you at every step, from army design and deployment to tactical maneuvers and command decisions until battle’s end. 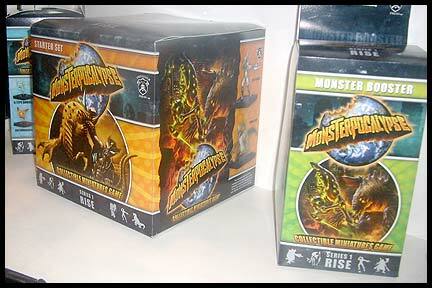 YMG has some great stuff coming for this game including Kingdoms, a campaign set and a Monsters set. Both are due out soon. As you can see from the photo below, YMG is also working on a historical version of Battlegrounds that’ll be fully compatible with the fantasy game. So, if you want you can have Orcs invade Imperial Rome! Flying Frog Games, another pretty young company is producing some interesting boardgames. 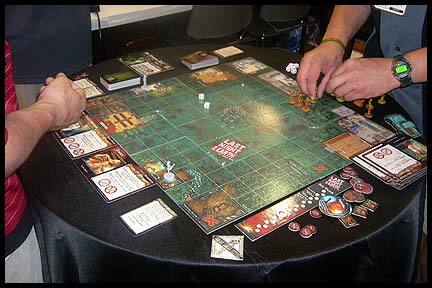 Their first game, Last Night on Earth, was a big hit for them in 2007 – selling out almost immediately. The zombie-theme game seemed to strike a chord with gamers. The first run sold out and the game was incredibly hard to come by. We finally were able to stock the game for the first time only about two months ago! Flying Frog recently released an expansion called Growing Hunger. Flying Frog is developing a new game, A Touch of Evil, set around 1800, this game allows each player to become a monster-hunting hero who competes with or cooperates with other players as they try to keep monsters such as a werewolf, a spectral horsemen, or a scarecrow, each with its minions, from the town. Sounds like it sure scare up some fun! If you like your games big, then Sailpower is for you! The Sailpower crew (as we affectionately refer to them at Alley Cat) was on hand running games of their fun-scale combat game set in the Age of Sail. It looked like everyone involved was having a blast! We carry the Sailpower rules at Alley Cat, so be sure to check ’em out next time you’re in and feeling nautical. Alrighty, that’s enough for this update. Even though I am not attending Origins on Saturday, I’ve got more to post about tomorrow. So, be sure to check back for another Origins report. 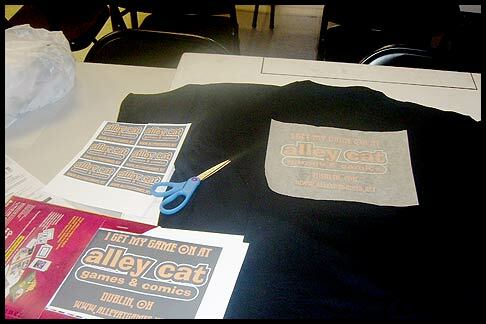 REMINDER: Alley Cat is open on Saturday, regular hours: 10am – 10pm. 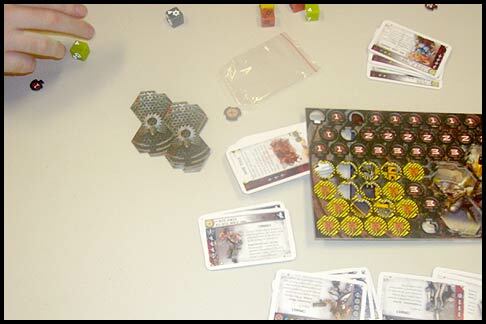 I’ll be at Origins again on Sunday morning for my last round of Mutant Chronicles demos. Come on out and check out this cool game from Fantasy Flight! FFG just announced today that they are retooling the game to make it a non-collectible game. No more blind boxes! Thanks, FFG! I spent the day downtown at the Greater Columbus Convention Center at the Origins Game Fair today! I spent the morning wandering around checking out what there was too see. Honestly, I didn’t see a whole lot that excited me on my first pass through the dealers room. As I mentioned in a previous entry many of the big companies (Wizards of the Coast, Wizkids and Upper Deck specifically) no longer attend the show, I and really feel that took a lot of the wind out of Origins sails…at least for me. 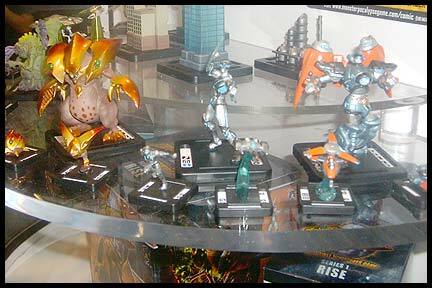 However, Privateer Press was there (albeit in a much smaller booth than previous years) and they had some paint masters for their upcoming Monsterpocalypse Collectible Miniatures Game that’s coming out this Fall. I grew up watching Godzilla movies every Saturday on KTVU Channel 2 in the Bay Area, and cannot wait for this game of monster mayhem! This game looks to be a whole lotta fun! Check out the development blog here for more information about the game. I can’t wait for Gen Con for a chance to play this one. 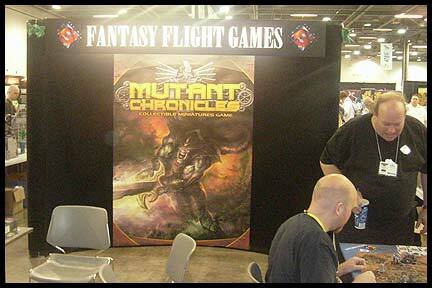 I spent the afternoon running demos of Mutant Chronicles for Fantasy Flight Games. I had the priviledge of meeting Mutant Chronicles Line Coordinator Tony Dulac in person, and I got to show folks how to play this awesome new game. It was a lot of fun with only a few bumpy spots as some rules got jumbled in my brain (the problem with playing too many different game systems). Hopefully the folks who were able to demo the game today became interested enough to check it out when it gets released this summer. I really think this game has tremendous potential and want to see it do well. 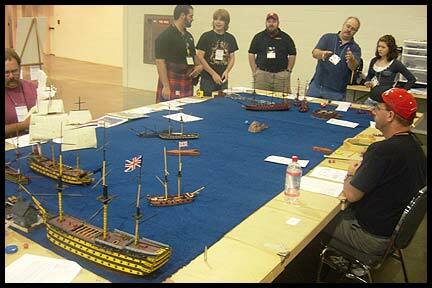 I was running demos in the Miniatures Hall. Lucas from FFG was also running some demos at the FFG booth (as seen above). 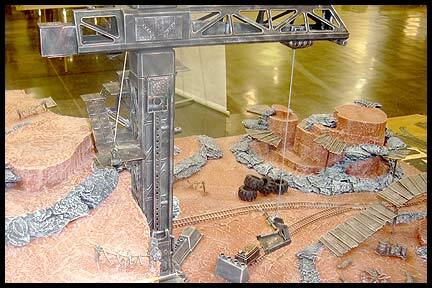 Below is a shot of one of the awesome demo tables that FFG staffer Bexley built for Gen Con last summer. 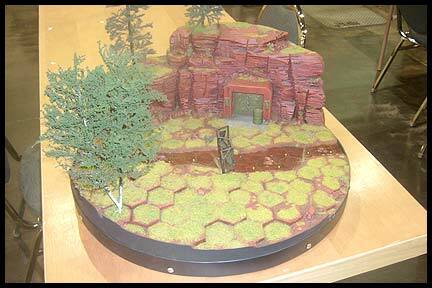 I’m a sucker for cool gaming terrain. 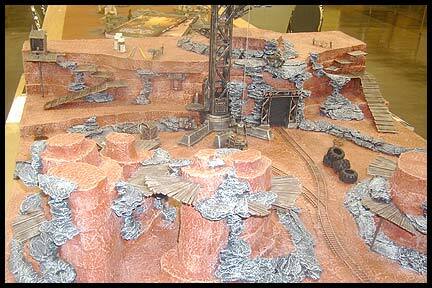 Speaking of cool gaming terrain. I snapped a few pics of this incredible table that was being used for Dark Age demos. It’s really an amazing piece. Dark Age Games have a tutorial on how this board was constructed on their website. You can checkout on their Articles page! It’s back to the Con tomorrow to run demos for AT-43 and Confrontation. I’ll be at the store on Saturday (we’re open regular hours on Saturday) then back at Origins again on Sunday for more Mutant Chronicles. 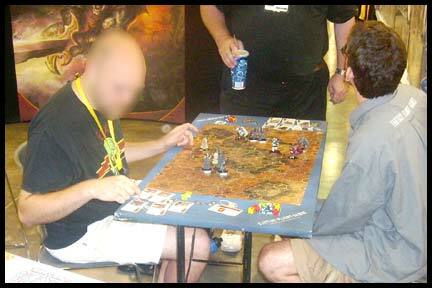 Be sure to check back tomorrow evening for Part 2 of my Origins 2008 report. I’ve been working on a couple projects here at the store in between helping customers today. I turned the game room into a miniature T-shirt factory. I was brainstorming with a customer the other day (Thanks, Blue!) about ways to promote the store at Origins this week and I thought about T-shirts. However, there was no way to get shirts made up in time for the convention. Blue had the brilliant idea of using iron on transfers. 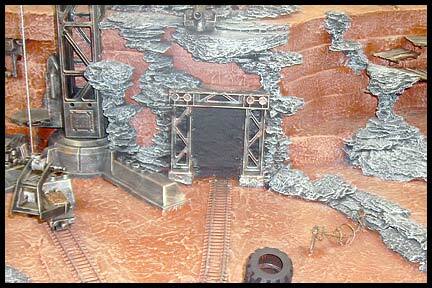 Another project I started (finally) to work on was a 3D terrain board for Mutant Chronicles. Another customer, Jeff, cut me a couple hundred styrofoam hexes. 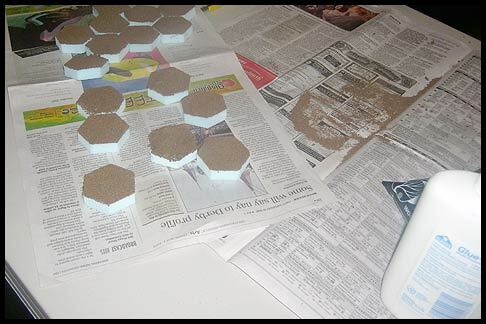 I finally got around to picking up some white glue and sand to create the texture and started working on this one. There’s still a long ways to go on this project! But, it should be pretty cool when it’s all done! Ah, my favorite time of year is upon us once again! Convention Season! 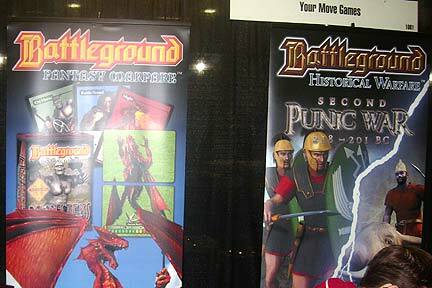 The Origins Game Fair begins this Wednesday right here in Columbus, Ohio. It runs from Wednesday through Sunday (the dealers room opens on Thursday morning). While Origins has lost some of it’s luster over the past couple of years as some of the bigger companies (Wizards of the Coast, Wizkids, Upper Deck, etc) have pulled out, it’s still one heck of a fun convention. I don’t even really play in any games while I’m there. I spend almost all my time in the dealers hall checking out new games, older games I haven’t really noticed before, playing demos and chatting with folks from various companies. This year I am going to be spending some time helping out the good folks at Fantasy Flight Games running demos for Mutant Chronicles, AT-43 and Confrontation. But, I’m still taking time to wander about and check out what’s what. With Origins going we’ve had to adjust our store hours a bit on Thursday and Friday. We’ll be closed during the day, and opening up at 6:00pm. Saturday will be normal hours (10:00am – 10:00pm), and we’re closed on Sunday (per usual). So, if you’re not downtown make sure you come see us Thursday and Friday evenings here at Alley Cat. NOTE: Due to Origins, there is no Pokemon League on Thursday 6/26. It will resume the following Thursday night! I’ll also have my trusty camera with me at Origins, so be sure to check back for news and updates about your favorite games! Also, running at the same time as Origins this year are Wizard World Chicago and the GI JOE Collectors Convention, both of which I will be at in spirit! 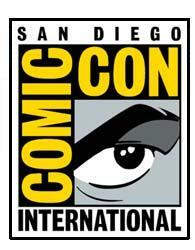 Then, in July, it’s the granddaddy of all conventions…Comic Con International (or the San Diego Comic Con, as it’s more commonly known). If I could only attend one convention a year, it would be this one. It’s amazing. It’s been a few years since I’ve gone and it’s doubled in size since then and become a true media event. Plus, for an action figure fan such as myself SDCC has become the best place for new product announcements next to Toy Fair! 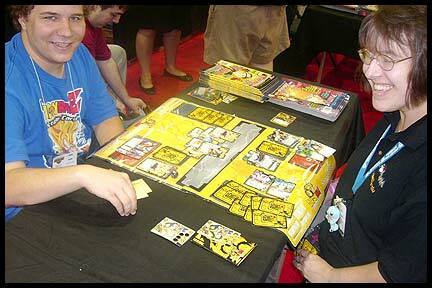 Then, in August, the mecca of the gaming world arrives: Gen Con Indy: The Best Four Days in gaming. And, much like SDCC, this is where many companies choose to announce their new products, show of new miniatures and generate excitement about their company well into 2009. I’m only able to attend on Sunday this year, but I’m going to make the most of that one day! So much to see, and so much to do! I can’t wait! So, it’s looking like a great summer for gaming and much more! It almost makes it worth the heat and humidity! The good folks over at TCGPlayer.com have posted some video coverage from the recent GAMA Trade Show. This video covers the upcoming World of Warcraft Miniatures Game that a bunch of us here at Alley Cat are really looking forward to. The first game of Fantasy Flight Games‘ long-awaited and much anticipated Mutant Chronicles Collectible Miniatures Game was played today at Alley Cat! The game is not quite out yet (expected in May), but FFG was giving away copies to retailers at the GAMA (Game Manufacturers of America) tradeshow going on right now in Vegas. I wasn’t able to attend the show, but the fine folks at FFG sent us a starter anyway. It arrived today and was promptly cracked open and played. Kennedy and Matt, two Alley Cat regulars, test drove the game while I finished checking in the shipment we received today and helped customers. They read through the rules, and got in two games. After such a long wait for this game I’m happy to report that the guys had a lot of fun, and are excited about the game. 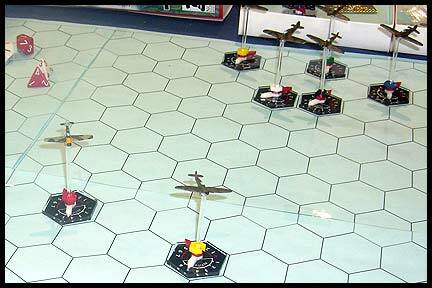 The game play was quick, and things like command cards and victory zones helped set the game apart from other collectible minis games. Keep an eye on the Alley Cat calendar. 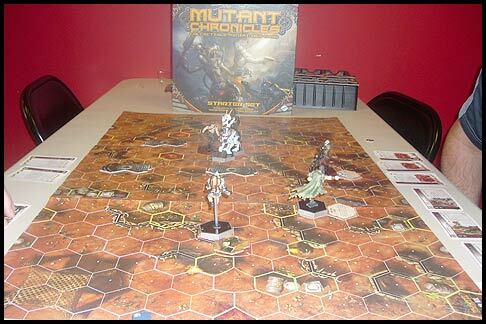 We’ll be scheduling some Mutant Chronicles demos very soon so you can check the game out in person.